This was one of my stand out reads for the year (one of the others being There But For The, also by Ali Smith) so this is a review I’ve really been looking forward to writing. The Accidental is written with wit and originality, has varied and complex characters and an engaging and surprising plot – contemporary fiction at its best. Shortlisted for both the Orange Prize and the Man Booker Prize, it won the Whitbread Novel Award in 2005, the year every man and their blog had this as a must read or book of the year. Set in Norfolk where the aptly named Smart family are taking their summer holiday together, it’s a study of how chance can affect the lives of ordinary people. The family in question consist of mother Eve, step-father Michael, teenage son Magnus and pre-teen daughter Astrid. Each of their lives are pulled apart and put back together again in an almost unrecognisable way by Amber, an unexpected houseguest. The Smart family are on the surface a somewhat smug, tight unit, however underneath all is not as it should be. Each character is struggling in some way whether it is from guilt, boredom, insecurity or total lack of direction. Amber’s arrival is the catalyst for change and throughout the journey of the novel the reader sees the impact that this change has on the character of each of the family members. At play here are also factors like the power of assumption and the ease with which people can be unwittingly manipulated and controlled. What I found interesting was that although Amber is not necessarily a ‘good’ person, all of the characters are changed for the better from having come in contact with her. 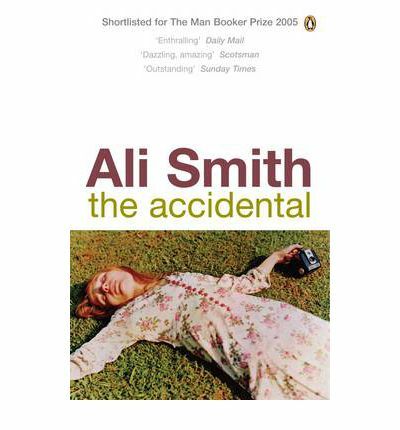 Ali Smith is a writer who obviously loves writing – this may seem like a rather redundant statement, but by it I mean that from reading her work, you gain an appreciation of the technique of good writing, and that the telling of stories and the way in which we do this seems to be a consistent theme of her work. The Accidental begins with a page of quotations from John Berger, Nick Cohen, Jane Austen, Sophocles and Charlie Chaplin. These quotes allude to the themes of the book, some of which are accident, history, and storytelling. This book is divided into three main sections entitled ‘the Beginning’, ‘the Middle’ and ‘the End’ in which all five characters have their say. Michael is a professor and poet who specialises in the sonnet form and his entire Middle section of the book is a sonnet cycle which I found both charming and incredibly clever. Eve is also a writer who writes fictional interviews with famous or infamous people who are no longer living. Much of her dialogue with herself is conducted in a question and answer form, another clever writerly technique. The narrative of the book is mostly driven by internal monologues from each character so as a reader you experience the course of events from four vastly different perspectives. As a consequence the book is more driven by character than plot, and as a person who enjoys reading from this perspective I found it intensely satisfying. That is not to say however that the plot is light or weak. I definitely didn’t see the clever twists at the end of the novel coming and they gave the novel an almost a circular feeling that paralleled the beginning, middle, end form neatly. I felt that this is book deserving of its place on the list in light of how rich, unique and incredibly well written it is, and I urge you to read it.